Today, the LHCb experiment at CERN’s Large Hadron Collider has reported the discovery of a class of particles known as pentaquarks. The collaboration has submitted a paper reporting these findings to the journal Physical Review Letters. Our understanding of the structure of matter was revolutionized in 1964 when American physicist, Murray Gell-Mann, proposed that a category of particles known as baryons, which includes protons and neutrons, are comprised of three fractionally charged objects called quarks, and that another category, mesons, are formed of quark-antiquark pairs. Gell-Mann was awarded the Nobel Prize in physics for this work in 1969. This quark model shown above also allows the existence of other quark composite states, such as pentaquarks composed of four quarks and an antiquark. Until now, however, no conclusive evidence for pentaquarks had been seen. The illustration below shows the possible layout of the quarks in a pentaquark particle such as those discovered at LHCb. 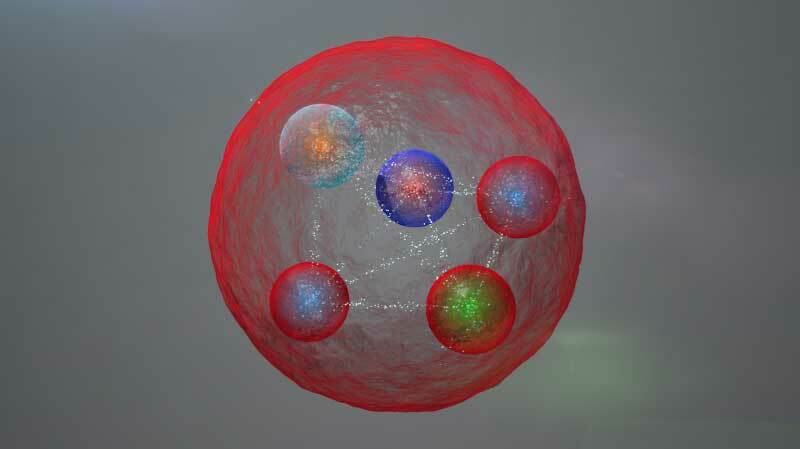 The five quarks might be tightly bonded (left). They might also be assembled into a meson (one quark and one antiquark) and a baryon (three quarks), weakly bound together. 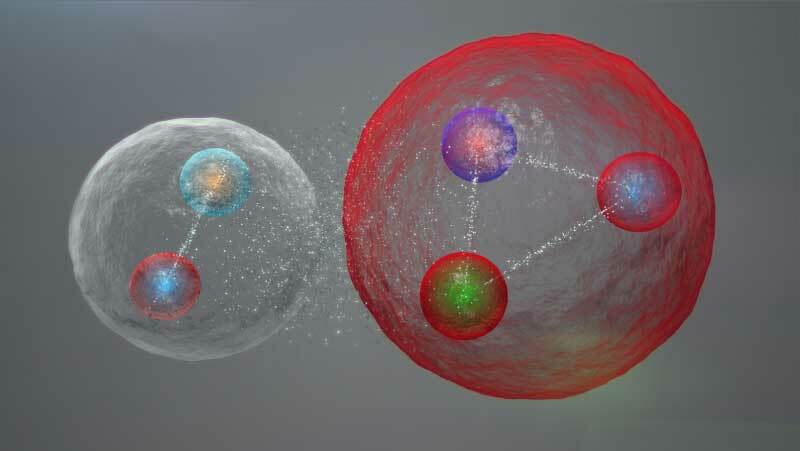 LHCb researchers looked for pentaquark states by examining the decay of a baryon known as Λb (Lambda b) into three other particles, a J/ψ- (J-psi), a proton and a charged kaon. Studying the spectrum of masses of the J/ψ and the proton revealed that intermediate states were sometimes involved in their production. These have been named Pc(4450)+ and Pc(4380)+, the former being clearly visible as a peak in the data, with the latter being required to describe the data fully.